If music is your topmost priority, then noise canceling earbuds could be your best companion. They block out all the ambient noises in the surrounding, allowing you to enjoy the music without any distractions. If we talk about Noise canceling headphones, then we have a lot of great headphones available on the market. But, if we talk about the earbuds, then there are only a handful of good noise canceling earbuds available. This makes it hard for a user to choose a pair of good earbuds. To make it easy for you, we did all the research and assembled reviews for the best noise canceling earbuds. All the earbuds mentioned in this post performed really well in our tests and we are pretty sure that they would be loved by most of the users. If we talk about headphones and earbuds, then Bose quiet comfort would end up being the best series. We have already tested QC 35 and QC 30 headphones from the series, both of which were noise canceling headphones and we were very much impressed with their overall performance. QC 20 are premium noise canceling earbuds, for which you would have to pay something higher than the mediocre earbuds. Along with noise canceling technology, the earbuds also come with an aware mode, that lets you hear the surrounding sounds just with a touch of a button (more information below). Exclusive Tri-port technology for the high-quality audio experience. Comes with inbuilt microphone and a one-touch button for answering calls. Aware mode for listening surrounding sound, while noise cancelation is turned on. Long lasting comfort with a beautiful design on top. Before we get into the detailed review of Qc20 earbuds, we want to let you know that there are basically two versions of these earbuds. One that’s compatible with Apple devices and another one with Android and Samsung devices. Make sure you buy the earbuds accordingly. The noise cancelation in Bose headphones/earbuds has always been excellent. These earbuds also come with an aware mode, that would allow you to listen to outside noises even with noise cancelation is turned on. Aware Mode: Once the noise cancelation is activated and the earbuds are plugged in, the only way to listen to the outside noises would be by turning off the noise cancelation from the module. But, with the aware mode, all you have to do is press a button and you would be able to listen to the outside noises. Also, there is no need to take out the noise cancelation module from the pocket as the aware mode button is present on the inline remote. Talking about the build quality of the earbuds, they look premium but are not that sturdy. You get various inline controls including a button to turn on aware mode, a button to answer calls, and few buttons to control your music. In the package, you also get a carrying pouch that is made up of nylon mesh material. Addilitialy they come with proprietary hear+ tips that ensure a tight and comfortable fit around your ears. The fit might be tight, but, that doesn’t mean the earbuds would feel uncomfortable to the ears. Even after the usage of continuous several hours, there would be no discomfort to your ears. The earbuds come with a separate noise cancelation module, that needs to be recharged after every 16 hours of usage. It features a standard Lithium-ion battery and can be charged with a standard USB charger. Earbuds would be operational even if the module is running low on buttery, it’s just that noise cancelation would be no longer active. Talking about the sound quality, it’s brilliant. 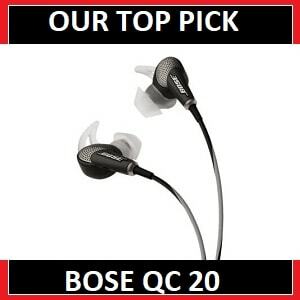 Bose is known for its outstanding sound and bass experience and the same can be experienced with QC20. Along with Bose Active EQ and Triport technology, you will get a high-quality music experience. Also, ANC works great. Exclusive Hear+ tips for long-lasting comfort. Comes with an aware mode. High-quality audio experience with exclusive tri-port technology. 16 hours of battery range for the noise cancelation module. If noise cancelation is your primary concern, then nothing could be better than the Bose QC20. Yes, they are a little bit expensive, but the quality of noise cancelation they offer, can’t be found with any other earbuds. Along with that, the sound and comfort quality is also excellent. 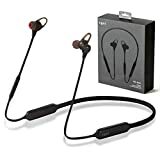 If you are looking for decent pair of noise canceling earbuds at a really cheap price point, then you would nothing better than these earbuds fron Taotronics. These are metal constructed earbuds that come with rubber ear tips for a snug fit. Active noise cancelation module features a 140mAh battery and can last up to 15 hours on a single charge. Active noise cancelation reduces background noises by up tp 30db. Made up of aluminum alloy and gold plated 3.5 mm audio jack. In-line remote for audio controls. 55-inch long cable for convenient listening. Interchangeable ear-buds for comfortable and snug fit. Separate noise cancelation module with 15 hours of battery range. Look, we don’t say that these are the best pair of noise-canceling earbuds in the market, but for the price at which you can get them, they are a really great product. The ear hooks added to them provide a very stable fit and also make them feel more comfortable at the same time. You also get extra inter-changeable earbuds, so that the earbuds fit perfectly, despite the shape and size of ear. One of the best things about earbuds is built quality. They are crafted with a shiny aluminum alloy that looks great, makes the earbuds durable, while keeping them lightweight at the same time. The earbuds also feature an airplane audio adapter and a 3.55mm gold-plated audio jack. The earbuds come with active noise cancelation, which is very surprising looking at the price point of the earbuds. With active noise cancelation in the earbuds, you can reduce the background noises by 30db and focus completely on the music. The noise cancelation is not something that you get to see in Bose earbuds, but still, for the price that you pay for these earbuds, it does a fantastic job. Audio experience on these earbuds is good. The sound is clear and the earbuds are better at lower frequencies than the higher frequencies. With ANC turned off the sound is very clear and with ANC turned on, it’s same. It’s surprising how ANC does not affect the sound quality at all. The earbuds are wired and can be used continuously for an unlimited number of hours, but the noise cancelation module that comes along needs to be recharged. The module comes with a 140mAh battery that can provide a range of up to 15 hours, which means that once the battery runs out, the noise cancelation part will stop working, while everything else would be operational. The one thing that’s not right with these earbuds is their performance for high-pitched voices. As said earlier, the low pitch voices sound good, but when it comes to high pitch audio, the earbuds start cranking up a bit. Comes with interchangeable earbuds and hooks. Comes with inline remote control buttons. Cranksup at high pitch voices. If you are very tight on budget and still want a pair of decent noise canceling earbuds, then you would find nothing cheaper than these Taotronics earbuds. They sound great, are very well contructed and come with active noise cancelation that cancels out most of the sorrounding noises. Amorno earbuds are modern wireless earbuds or as we prefer to call them, earplugs, that run on the very latest Bluetooth 5.0. For people who are a fan of apple airpods, but found them quite expensive, could definitely go for these noises canceling earbuds. The earbuds use DSP noise cancelation technology to reduce ambient noises. Comes with DSP noise cancelation technology. Comes with Bluetooth V5.0 chipset. Up to 3 hours of playback time on a single charge. Portable 500 mAh charging case that can charge the earbuds 4 times. Option to connect both the earbuds to two different devices. Comfortable, lightweight and sweatproof design. As previously said, Amorno wireless earbuds are built for the people who are looking to get truly wireless earbuds with a great noise cancelation technology. Another good thing about the earbuds is that they come with the very latest Bluetooth 5.0. If we talk about the design and build quality of the earbuds, they are fine. The design is neat and simple, and the earbuds are available in two different colors black and gold (rose gold to be very specific). The body is made up of lightweight material which is also sweatproof. The silicon earbuds are available in thee different sizes and are very soft. The battery range of the earbuds is only 3 hours, which seems a bit disappointing, but, since it comes with a 500mAh charging case that can actually charge these earbuds 4 times, it shouldn’t be a problem for users. Yes, it will still restrict users from using the earbuds for a longer period of time. The earbuds also come with the multi-connectivity option, which means that the earbuds could be connected to two devices simultaneously. Talking about the sound quality and quality of noise cancelation on these earbuds, the company has used DSP noise cancelation technology to block out the external noises. DSP technology identifies and examines the character of input noise waveform and then generate the anti-noise waveform to cancel it. In simple words, the noise cancelation on these earbuds works well. Mids on these earbuds sound natural and the bass is super balanced. The manufacturer had focused more on the bass and it can be felt when the earbuds are on. Earbuds also use premium vibrating diaphragm technology that ensures a truly H-Fi 3D sound. Comes with latest Bluetooth V5.0. Comes with 500mAh portable battery charging case. These are one of the greatest truly wireless earbuds that come at price tag that you wouldn’t believe. The sound quality is fantatsic, the noise cancelation is fantatsic and the design also looks very well. We highly reommend these to any user who is looking for a pair of budget-frienly noise canceling earbuds. Back Bay FC50 are one the cheapest pairs of noise canceling earbuds we ever came across. They are very close to the Toatronics earbuds in terms of price, but in terms of sound and quality, they are far ahead. Another thing that keeps them ahead of taotronics earbuds is that these are wireless earbuds that can run up to 8 hours on a single charge. Strong bass accompanied by natural mid-range and crisp highs. Runs on Bluetooth with a range of 30 feet. Comes with inline remote control and built-in microphone. 8 hours of battery range with ANC active and 12 hours of range with ANC Off. Back Bay FC50s are one of the newest pairs of noise-canceling earbuds in the market, that has an amazing satisfaction rate among users. If we compare them with Taotroncs earbuds, you will find that both of them come at a very low price range. The feature where Back bay Fc50 excels is wireless technology. Unlike taotronics earbuds, the FC50 are wireless earbuds that provide a battery range of up to 12 hours on a single charge. But, the noise cancelation on these earbuds is not as good as the taotronics earbuds. It can not cancel out all of the external noises, mainly strong noises like train and traffic, but they work well in other places like the library and offices. So, if you fine with mild ANC, you are good to go with them. Talking about the build quality and overall design, the earbuds are built in a flex-fit design that causes no discomfort. the earbuds come in one single color black with a little touch of silver color on the back. with the earbuds, you get 3 pairs of ear-tips, so that you get a snug fit despite the size of your ears. Apart from the wireless connectivity, one thing that makes these earbuds stand out from other cheap earbuds is the 5 EQ sound settings. The earbuds come with the ability to change equalizer settings. 5 different sound settings are as follows: Back bay signature, Atlanta bass, Stadium rock, Pure podcast, and clean classical. Last but not the least, the audio quality in the earbuds in finely tuned to produce classic American hi-fi sound – natural and clear vocals accompanied with strong bass. Up to 12 hours of battery range. Comes with Back-bay’s speed charge technology for faster charging. Extremely lightweight. Weighs just 3.52 ounces. Not so strong Active Noise cancelation. Back Bay FC50 perform really great in terms of sound, but lack that perfection in Active noise cancelatio. But, since they are so cheap we shouldn’t be complaining about that.If you are fine with having a less stron ANC, you might consider them. These are wireless neckband earbuds that feature Bluetooth 4.2 connectivity. Active noise cancelation on these earbuds can cancel up to 90% of the background noises giving you a complete room to enjoy the music. The earbuds offer an excellent battery range of 8 hours. The overall price point of the earbuds is quite low and the sound quality is good. Comfortable around the neck design. 8 hours of battery range. Built-in microphone for taking calls. The earbuds are build of plastic, come with silicone earbuds and are available in only black color. The build quality is solid and the neckband sits comfortably around the neck. On the band itself, you get an in-line remote with buttons that could be used to control the music, manage volume and also answer/reject calls. Along with the remote control, you also get the active noise cancelation module with a button to turn on/off the ANC. Remember, turning off ANC when not needed can improve the battery range. ANC on these earbuds can effectively reduce surrounding noises by up to 25db. So if you are looking to enjoy your music in an airplane, subway, traffic or in a busy office, these earbuds would be of great help. Since these are magnetic earbud, you don’t have to worry about them sliding off. Magnetic design keeps both the earbuds attached when not in use so that the earbuds can securely hang around your neck. The battery range and charging time is very impressive. it only takes 1.5 hours for them to full charge themselves, resulting in 8 hours of music playback. 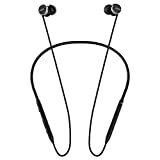 The earbuds feature Bluetooth v2.0 functionality that provides fast and strong connectivity up to 33 feet. Talking about the sound quality, the earbuds feature dynamic drivers to produce balanced distortion-free sound. Not only the sound, but the bass s crisp too and with ANC being turned you get even crispier sound and thumping bass experience. The one thing that could have been better is the placement of the buttons. The buttons are down facing which is slightly annoying, also the size and shape of volume buttons and power buttons is the same, which makes it confusing for the user to press the right button. Great battery range of 8 hours. Active noise cancelation works really good. Magnetic designs that prevent falling off. Placement of buttons could have been better. Another pair of earbuds that sounds good, feels comfortable and is also affordable at the same time. The ANC works well and cancels up to 95% of the ambient noises. Overall a complete value for mone earbuds for users who don’t want to spend much. Bang and Oufsen (B&O) is a very renowned brand in the field of audio devices. The company produces all types of devices including speakers and earbuds and is known for its quality products. Beoplay E4 here is a direct competitor to Bose Qc20 in terms of specification. we can not say that overall it’s better than Qc20, but in some aspects, specially design, it is definitely better. This review would be most likely a comparison with the Qc20 since both of them come at a similar price range. Bang and Oulsen signature sound quality. Advanced hybrid active noise cancelation. 20 hours of playback time with Active Noise cancelation enabled. Comes with transparency mode (more information below). Minimalist lightweight design with metal and rubber finishes. Comfort fit with interchangeable ear tips. Equipped with sleek and user-friendly inline remote control. Right of the bat, we would like to say one thing, if you are actually confused between Bose QC20 and B&O E4, then go for Qc20. Bose is known for its world-class noise cancelation technology and it couldn’t be compared with any other brands in the market. Now moving on to the review of the B&O E4, the earbuds use two microphones for noise cancelation that allows you to completely shut the outside noises. 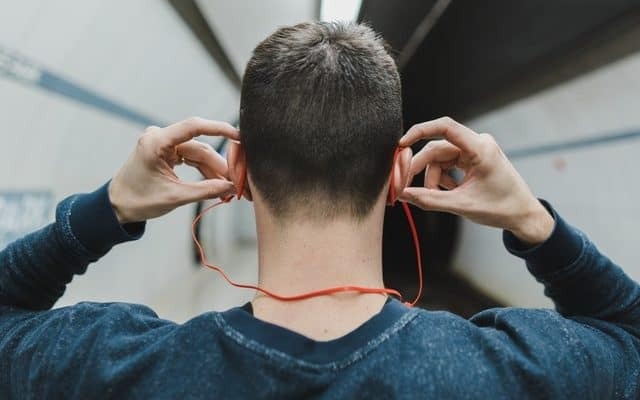 This will help you focus completely on the music, or just to ignore the outside world. Remember, the noise cancelation works with noise cancelation module that comes along, which needs to be recharged. At one full recharge, you can use the noise cancelation tech for up to 20 hours. While the advance active noise cancelation in these earbuds lets you ignore the outside noises completely, it’s easy to hear those noises easily at any point in time. Just with a gesture, you can activate the inbuilt transparency mode, which will temporarily disable the noise cancelation mode, allowing you to hear the outside noises. Talking about the most important aspect of any earbuds, the sound quality, these earbuds come packed with Band and Olufsen signature sound quality, Unlike other earbuds, the sound quality is not disrupted with Active Noise cancelation. So, doesn’t matter if the ANC is turned on or off, you will get a crisp and clear audio experience. Though the audio is good, we didn’t feel the same for the bass. The bass is weak and it gets weaker when ANC is turned on. Now for someone who is paying a good amount of money for premium earbuds, would definitely be disappointed with bass. But, if you really don’t care about bass, there is nothing you should worry about. Apart from bass, everything is excellent. Apart from the excellent audio features, the earbuds are beautifully designed and built as well. Thee earbuds are crafted with extra lightweight material that gives them a minimalist look. Scratch resistant and robust material on the exterior is hairline brushed and pearl blasted for even beautiful finish. Along with the design of the earbuds, the manufacturer has focused on comfort quality as well. The earbuds come with 5 sizes of interchangeable ear tips that are made up of soft memory foam, which feels really great on ears. 20 hours of ANC backup on one charge. Extremely beautiful design with a robust exterior. Great sound quality with both ANC On/OFF mode. Bang and Olufsen E4 are surely the most beautiful pair of earbuds in this list. They are very well designed and provide a comfort fit on ears. The sound quality is good and the noise cancelation is great. One thing that’s not good about them is the bass. Recently during our round-up of Best wireless headphones, we tested Cowin E7 and they ended up being really good noise canceling headphones. 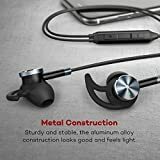 Cowin HE5 A over here is lightweight and durable earbuds that are packed with active noise cancelation and come at a very cheap price point. The earbuds are packed with the latest Bluetooth 4.2 and can offer a playback time of 8 hours on a charge of 2.5 hours. Professional active noise cancelation technology. Runs of the latest Bluetooth 4.2 tech. Comes with inbuilt remote and in-line high-quality microphone. CD-like quality audio for the great listening experience. Cowin HE5A is another entry-level headset that comes with nice active noise cancelation technology and some other pretty decent feature. Starting off with the build quality and design of the earbuds, it’s a neckband design that it’s well and comfortably stays in place. The build quality of the main wires is not very sturdy, but until and unless you would play really rough, they would not be damaged. The earbuds are available in only one color, black, with little silver color on the edges of both the earbuds. The overall sound quality of these earbuds at this price range is pretty impressive. They are excellent in terms of bass and decent in mids and highs. At maximum volume level, they get really loud, which along with noise cancelation cuts of all the external noises. Even without any music, ANC works very well. You get a button on the in-line remote to turn on/off ANC. 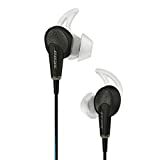 If you compare these earbuds head to head with Back Bay Fc50, then they will lose in terms of EQ sound settings and battery performance, but, if you are going to compare them with taotronics earbuds then you will find both of them as very close competitors. The one thing that might disappoint some of the users is the quality of the microphone. Also, there is no dedicated button to answer calls, which also means you will not be able to active google assistant/Siri from the in-line remote control. So if you are habitual of these features, these earbuds are not for you. Runs on the latest Bluetooth 4.2 with BES chip. Robust bass and loud sound. Professional grade active noise cancelation. No dedicated button for answering calls/activating siri/google assistant. Cowin HE5A is another option for those who are looking for some low-budget noise canceling earbuds. It comes with every feature that normal earbuds should have. The one thing that’s really bad about the earbuds is the quality of in-line microphone. The probability is high that you have not heard of this brand yet. HB-N50 from SGNL are mid-budget wireless noise canceling earbuds that run on Bluetooth 4.1 and can provide a battery range of up to 13 hours. The one thing that we found really interesting about these earbuds is the IPX4 technology, which means that they are sweat and water resistant. Up to 97% noise cancelation when ANC turned on. Comes with Bluetooth 4.1 connectivity technology. IPX4 certified: Could be used during the workout and during rains. Up to 13 hours of playback time on a single charge. Ergonomic earhooks for comfortable and snug fit. To be very honest, these earbuds have the capability to give competition to high-end brands. The noise cancelation technology that comes with them is pretty good and is said to cancel 97% of the external noises. One exclusive feature that comes with these earbuds is the open ear control mode. This mode allows you to hear the ambient noises just with the touch of a button. The button to turn on the open control mode is present on the in-line remote control. Now let’s talk about the design and comfort quality on these earbuds. The design of these earbuds is very basic, neither too fancy nor too dull. The neckband is magnetic which prevents the earbuds from falling when traveling or exercising. The ear-bud tips are comfortable an are available in 3 different sizes. On top of that, you get ergonomic ear hook attached to the earbuds for a tight fit. Earbuds run on Bluetooth 4.1 with a standard connectivity range of 33 feet. The rechargeable battery that comes along provides 13 hours of playback time with ANC off and 9 hours of playback time with ANC on, on a full charge. Another good technology that is integrated into these earbuds is the IPX4 waterproof technology. These sweatproof earbuds are safe to use during sweat workout, sports and can handle splashes of water. please don’t use them in rains, they are not waterproof. Can cancel up to 97% of the external noises. Ergonomic ear hooks for a snug fit. SGNL earbuds could end up being a pretty decent alternative to high-end earbuds. 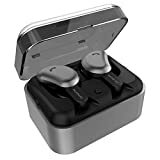 They come with excellent noise cancelaton, great sound quality and a comfortablle magnetic neckband design that would be preferred by most of the wireless earbuds users. These earbuds from audio technica could be treat for users who like to have braded AnC earuds at an affordable price point. They come at a mid-budget price range, which is very surprising since Audio Technica is a very renowned brand. The earbuds come with active noise cancelation which can cancel the distracting background noises up to 90% while maintaining the superior sound quality. Comes with In-line remote controls and mcirophone. Active noise cancelation can reduce up to 90% of background noises. Interchangeable ear tips for a better fit. Audio functions even with the discharged battery in ANC module. Engineered to work great in areas with high ambient noises. If you have some experience buying earbuds or headphones then the chances are that you would be familiar with the Audio Technica brand. In past, we have tested a lot of headphones from this brand. Headphones like Audio Technica STH M50X have ended up being one of the best studio headphones in the market. The pair of earbuds that we are reviewing here is very budget friendly, but might not be the ideal fit for everyone. The noise canceling technology that comes with these earbuds can cancel up to 90% of the background noises. It is engineered in a way that it provides great listening experience to users even in areas with high ambient noises. Talking about the design and build quality of the earbuds, it’s really basic. The earbuds come in matte finished gray color with branding on the back side of the earbuds. The earbud tips are smooth and are interchangeable so that everyone can get a perfect fit. As similar to other earbuds these too come with external noise cancelation module that has a switch to turn on and off the ANC. One of the things that are different here is that the ANC module does not come with a rechargeable lithium battery, instead runs on AAA batteries. Now, this is something that is both liked and disliked by the users. One of thing that would bother most of the users is the length of the cord that comes along, it’s quite small in length and we would recommend every to buy a new chord with a better length. The sound quality of these AT’s is decent, but please do not expect them to perform like $300 Bose earbuds. ANC runs on AAA batteries and not rechargeable lithium battery. Ultra compact and comfortable design. Chord that comes with it is short in length. 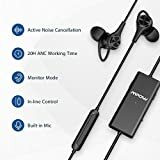 If you are looking to buy a pair of noise canceling earbuds from a big brand then you mght not find anything cheaper than this. But if you care more about the audio experience then we think earbuds like Back Bay F50 and Taotronics earbuds could be better deals. These are also along one of the cheapest noise canceling earbuds that you will ever come across. They look very similar to taotronics earbuds except for the fact that they come with better battery life. The most surprising thing about these cheap noise canceling earbuds is that they come advance monitoring mode which gives you the option to hear the surrounding noise while ANC is turned on. ANC reduces external noises by up to 25db. Battery range of up to 20 hours on a single charge (for ANC). In-line remote control with inbuilt microphone. Comes with different sizes of ear tips and earhooks. Right off the bat, we would like to start this review by talking about the battery range of the noise cancelation module. The module has a 120 mAh that takes around 2 hours to fully recharge, thereafter providing a battery range of around 20 hours, both for listening to music and making calls. Talking about the build quality and design of the earbuds, the earbuds are mainly build up of plastic with little metal used at the back of earbuds. The design is very basic and acceptable. With the different sizes ear hooks that comes along, the earbuds fit really well into all types of ears. Talking about the one special feature that comes along with these earbuds, the advanced monitoring mode. The advance monitoring mode is similar to the aware mode that we got to see in the Bose qc20 earbuds. Advanced monitoring mode allows you to hear to the external noises even when the active noise cancellation is turned on. You can easily turn on the advanced monitoring mode when needed, just with a touch of a button that is available on the noise cancellation module. It’s like a temporary ANC shutdown when you want to hear out the ambient noises. Coming to the most important aspect of these earbuds, sound quality, and ANC performance. 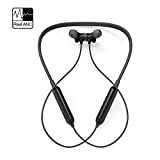 The active noise cancellation technology on these earbuds can cancel surrounding noises by up to 25dB, which means that you will decent ANC, but nothing very special. The sound quality is something that you get in branded earbuds, which looking at the price of the earbuds is very much surprising. The earphones are also very lightweight which makes them easy to keep and carry. In the package, you get a carrying case that would allow you to travel with them easily. You also get 18 months of warranty along with it. Comes with extra sizes of ear hooks. Could last up to 20 hours on a single charge. As said earlier, these are one of the cheapest pair of earbuds that are available in the market. The noise cancellation technology is decent, the sound quality is good, the overall design and the comfort quality is great too. For someone who is extremely low on budget, should certainly buy these earbuds. Before you head over and buy a pair of noise-canceling earbuds for yourself, you must know the technology behind them and a few other things that need to be considered other than the noise cancelation feature let alone. Basically, there are two types of earbuds available: Noise isolating earbuds and noise-canceling earbuds. Both of them might sound similar but offer a completely different music listening experience. Below is the comparison tabs, where you can see a clear detailed description of both types of earbuds. Noise isolation completely depends on the build of the earbuds. Basically, noise isolating earbuds create a seal between the earbud and the ear, preventing any of the external noises to enter. The goal is to create a strong seal between your earphone and the ear so that you can only hear your music. To that point, noise isolating earbuds complete base on well you fit them in your ear, there is no technology used in them. Noise isolation is often referred to as Passive Noise cancelation. Noise cancellation, on the other hand, use digital signal processing (DSP) to actively cancel out the external noises. 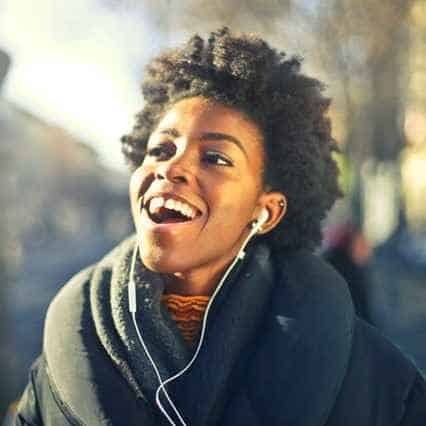 In simple words, active noise cancelation or noise cancelation means that the earbuds have an internal audio processor and microphone that takes the external ambient noises and plays an opposite sound to cancel it out. Most of the earbuds can handle ambient noises from conversations, traffic, and even jet engines. The noise cancelation mechanism not only works when you are listening to music but also works even if the music is turned off. so if you are just looking for some peace and quiet, you will get that with the technology. Noise cancelation is often referred to as Active Noise cancelation. 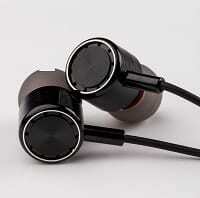 How to Choose a pair of Noise canceling earbuds? Shopping for a noise canceling earbuds is not an easy task. All of the models on this list boast noise-canceling technology, some outperform others in terms of noise cancelation, so do it n terms of audio quality, while some come at a hefty price tag that makes a user think twice. There are basically two types of earbuds available: on-ear and in-ear. The main difference between the design of both the earbuds is that the on-ear earbuds rest on the very edge of the ear, while the in-ear earbuds have a little nozzle shape structure that allows them to get a little deep into ears. In-ear earbuds by default provide really good noise isolation as compared to on-ear earbuds. It’s pretty obvious that anyone who is looking for a great noise canceling experience must go for in-ear earbuds. Noise canceling earbuds are present in every budget range. If you talk about one of the most expensive earbuds, then the first name that would come up is the Bose QC series, but remember, it is also the best series when it comes with noise canceling earbuds. Since active noise cancelation has its own circuitry, that adds up extra cost to the overall price. And then we have build quality, sound quality, comfort, connectivity options and similar things that also affect the price to an extent. Lets put it this way if you want great noise canceling earbuds with great sound quality, then be ready to pay for it. Good earbuds don’t get cheap, add noise cancelation to it and you are looking at something even more expensive. the earbuds that come at a low-budget range are good to have some peace in offices or in a noisy neighborhood, but those won’t be helpful when traveling on a plane. Should I go for Wireless Earbuds? Noise canceling technology is not depended on the connectivity in any way, so you can go for either of the styles without worrying about the noise cancelation. In 2018, we always recommend everyone to go for wireless earbuds only. Back in time, it was a real debate between wireless and wired earbuds, there was definitely a significant difference in sound quality between both of them. But, with improvement in technology sound quality in wireless earbuds have become the same as in wired ones. If we talk about the noise canceling technology in a wireless earbud, then we think that Bose earbuds are the best. Be it wireless headphones or earbuds, Bose integrates the noise canceling technology really well. Noise cancelation whatsoever has no effect on the bass. If your earbuds have bass in them, you will feel it. Bass also depends on how well the earbuds fit into your ear, tighter the fit better would be the bass experience.